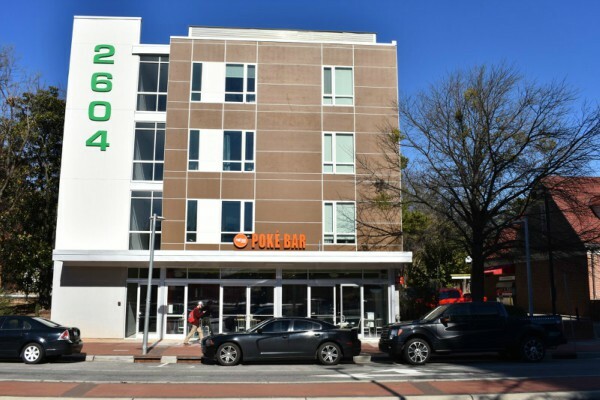 Poké Bar opened their doors to Hillsborough Street in January this year. Poké Bar is a franchise restaurant which has opened new locations sporadically across the country. Our very own Poké Bar Hillsborough Street location was the first to open in North Carolina. They are located directly across from DH Hill Library located on North Carolina State University Main Campus. 2604 Hillsborough, a student apartment complex, inhabits the space above Poké Bar. Exterior view of Poké Bar's newest location. The Poké Bar decided to take a modern twist on the food they know, love and adore, sushi. Sushi has raved with popularity and has become a part of the American diet. However, eating sushi can oftentimes come with a burden of time. 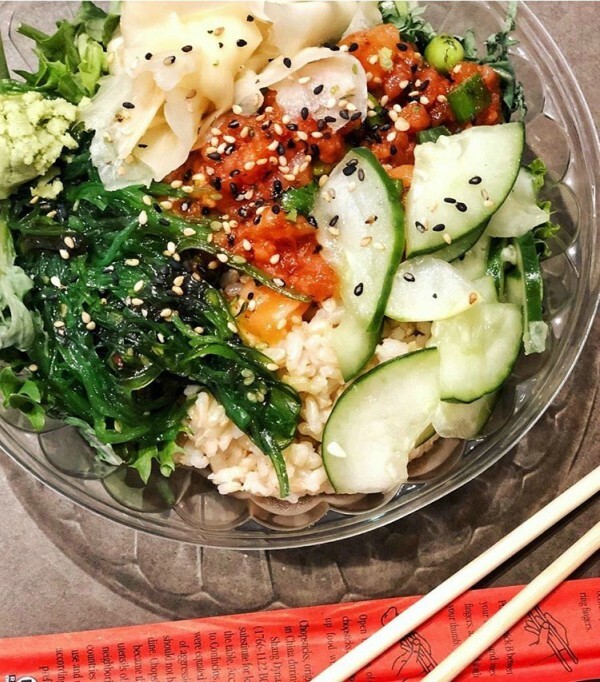 The poké bowl concept is the reinvent this idea of eating sushi in a timely and cost efficient manner. Poké Bar provides the option to take the bowl on the go, but still uphold the fresh quality sushi taste. After hearing about the new poké bowl trend, I was eager to uncover what Poké Bar was all about! My delicious poké bowl masterpiece. Employees eagerly welcomed me into Poké Bar, and clarified how their poké bowl bar worked. They went above and beyond to even provide suggestions for my poké bowl creation. Without their outstanding assistance, I would have been overwhelmed by all the options Poké Bar provides. I ordered the small poké bowl which includes two proteins and the base which is your choice of white or brown rice, or spring mixed greens. From there, the options are endless! Sauces as you would see on sushi rolls such as Spicy Mayo, Wasabi Mayo and Soy Sauce are provided. “Mix-ins” are the next stop, which includes corn, jalapeno, cilantro, kale, cucumber, sweet onion and pineapple. But you aren't finished yet! With the small bowl, two sides are provided. Options for sides include cucumber salad, seaweed salad and imitation crab. To top off your bowl, selections such as avocado, ginger, wasabi, masago and nuts are available for your choosing. 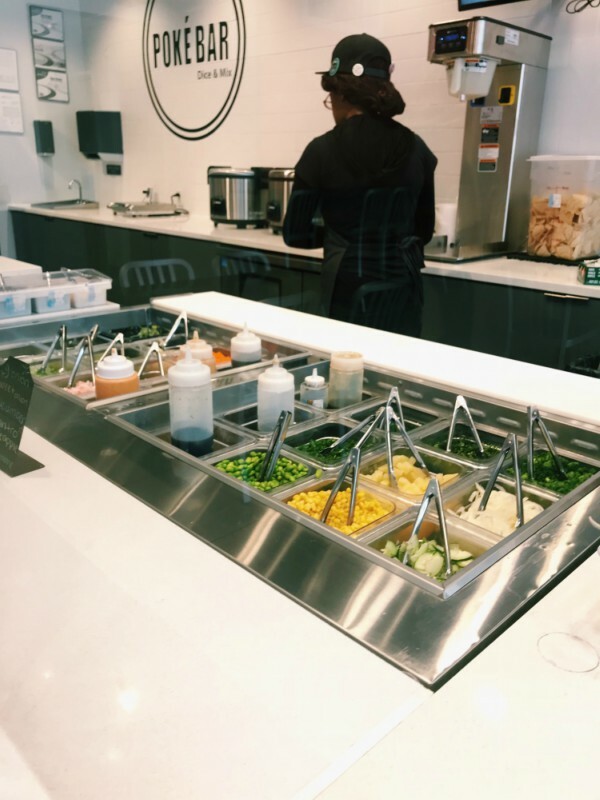 "Mix-In" Bar prepared to spice up a poké bowl. My poké bowl masterpiece was even better than sushi! I love the sushi taste in the convenience of a bowl for carry out purposes. The bowl is much easier to eat from in comparison to skillfully attempting to fit a large piece of sushi in your mouth without having the piece crumple apart! The prices for the bowls were very reasonable when comparing them to average sushi prices. In my opinion, the bowls cater more food for the price than the average sushi bar. I would highly recommend visiting this unique, trendy location on Hillsborough Street for a one-of-a-kind experience.